Our Martial Arts Academy established in 1991 specialises in teaching Freestyle Karate, Jujitsu, and Kickboxing at our recently refurbished facility in the Tollbar Business Park, Stacksteads, Bacup. Under the expert tutorage of Alf Love (England National Coach) and our CRB approved instructors, students are taught martial arts techniques, fitness and self protection which in turn develops discipline, self esteem and self confidence. Our lessons are tailored for students of all ages with children as young as 4 years old attending our kid’s lessons. The Academy has been very successful at National and World Championship kickboxing events over the years and has a reputation for producing many National and World Kickboxing Champions who have represented their club and country all over the world. As a result of our training programmes we continue to produce competitors of the highest standard and are widely respected throughout the kickboxing community nationwide. We are a competitive club but understand some students reluctance to participate in competitions, it is therefore left very much to the individual as to the level they wish to reach within the club. Our Academy's Freestyle Karate training programme will start to grade students once they have reached the required level within their training, students are then taken through the grading syllabus attaining belts when passing grade examinations. The Academy has been associated with Joe Tierney's 'Shorai International' organisation from 1996. The organisation founded in 1986 is a National Body for Martial Arts clubs representing all styles including jujitsu, karate, freestyle, mixed martial arts and kickboxing. With clubs located all over the country 'Shorai International' has over 1500 members and many qualified professional instructors. Our affiliation to 'Shorai International' allows the academy to share experience and knowledge with other member clubs and more importantly with Joe himself, who having been involved in our sport for over 35 years at the highest level is respected worldwide within the martial arts community, we are therefore extremely privileged and proud to have Joe associated with our Academy. We are working with the Rossendale Alive Communities team in encouraging the people of Rossendale to take part in leisure activity and offer everyone interested in joining our Academy two free introductory lessons without obligation. Our Academy founded in 1991 benefits from having a wealth of experience in training students from all ages, we set a high standard for our students to achieve and have excellent training facilities which makes us one of the premier Martial Arts club in the country. 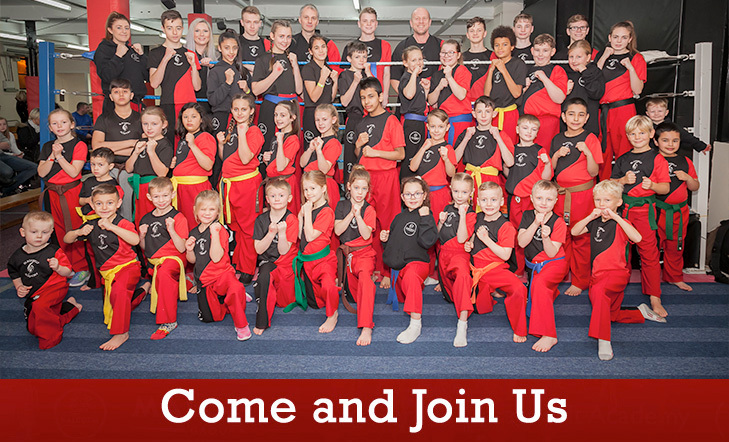 If you or your children are looking to Martial Arts to either get fit, learn self defence, or ultimately reach the standard to be able to compete at the highest level we are the club to join. For more details about our Academy please feel free to access the individual sections within the website which contain loads of information and facts about us. If you are sufficiently interested in what we have to offer please click on the contact us link.